Tim Tebow and Wire Mesh??!!! 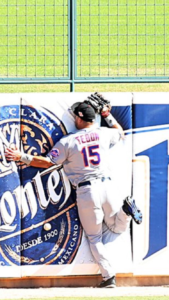 Time Tebow, crashes into padded fence. Wire mesh infill panel is present. By all accounts, Tim Tebow is a talented athlete. He won the Heisman Trophy as a quarterback for the University of Florida. He played in the NFL, and now, he is playing minor league baseball in the New York Mets organization. In this photo of Tim crashing into a wall, we at Darby are drawn to see the wire mesh infill panels that are used above the padded fence. Both welded and woven wire mesh specifications are commonly used in infill panels at ball parks, stadiums, amusement parks and playgrounds. Previous Post: Previous post: Too good not to share!! Next Post: Next post: World Series and Wire Mesh!